Egypt's Christians continue to struggle to get government approval for church building and repair projects despite the reforms implemented by a church construction law approved in 2016. A new report by the Project on Middle East Democracy (POMED) concluded that "the positive impact" of the law "has been minimal." Christians make up about 10 percent of Egypt's population—most belong to the Coptic Orthodox Church. The country's Christian community faces numerous legal and nonlegal obstacles to church construction. "Local sensitivities" sometimes manifest in the form of Muslim community members opposing, even by violent means, the building of a church, according to the report. Security agencies also influence the process governing church construction and have been known to stop or limit construction and repairs in the interest of addressing genuine or apparent security threats. In 2013, a military coup overthrew the ruling Muslim Brotherhood. The Coptic Orthodox Church supported the military due to concerns that the Brotherhood posed an existential threat to Egypt's Christians. The current president, Abdel Fattah el-Sisi, developed a strong relationship with Coptic Pope Tawadros II, making the time ripe for new reforms to church construction laws. Kurt Werthmuller, a policy analyst at the U.S. Commission on International Religious Freedom, acknowledged the commission still has many concerns about the status of Egypt's Coptic community, but said Sisi, "at least ostensibly … has said things and made, sort of, grand gestures to the Coptic community that other Egyptian presidents either haven't wanted to or haven't bothered to do," which has strengthened the relationship between the Coptic Church and the government. 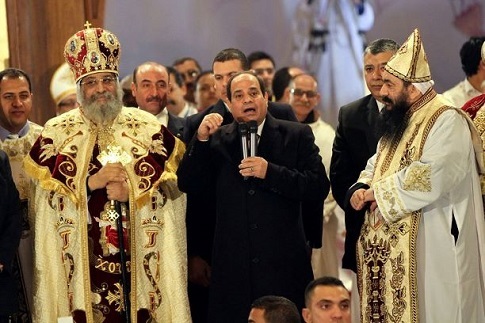 Werthmuller pointed to Sisi attending Coptic Christmas liturgy as an example. "Those sorts of visible, public gestures are important for the Coptic Orthodox leadership," he told the Washington Free Beacon. In 2016, the Church Construction and Renovation Law (Law 80/2016) went into effect. Among its various provisions, the law "regulates the process of obtaining permits for constructing, expanding, modifying, renovating, reconstructing, and making external repairs to a church, a church annex, a service building, or an abbey," and "mandates that the Cabinet of Ministers create a committee to oversee applications to legalize unlicensed churches and adjacent buildings such as abbeys, church annexes, and event halls." That committee was created in 2017. Claire Evans, regional manager for the Middle East at the nonprofit International Christian Concern, told the Free Beacon that control of application approvals by governors could be an issue "if the governor doesn't like Christians." The law contains other problems, including its ambiguous requirement that a church should be "proportional to the size and needs of the community it serves." The law does not define "‘proportional' or ‘needs' or who makes such a determination." Another issue is that security agencies are given "a legal role with regard to church issues for the first time in Egypt’s history" through their presence on the committee overseeing applications of unlicensed churches. Applications from unlicensed churches seem to be moving more quickly—508 have been recognized as houses of worship. But even this constitutes "only 14 percent of the total number of applications." There are multiple possible explanations for why the law's positive impact has been limited. Bureaucratic inefficiency is likely one culprit: Information provided by unlicensed churches has to be examined by officials on the legalization committee, leaving the door open "for officials at various levels to hold up approvals for any number of reasons, including bias against church building that continues to exist within parts of the state apparatus." Similarly, administrative confusion may have delayed the law's implementation. For almost a year after the law was approved, some officials thought implementation "was awaiting the issuance of executive regulations (explanatory by-laws)," until it was eventually clarified that the law was, in fact, in effect. The authors of the report argue "a unified houses of worship law, with the same rules for churches, mosques, and other places of worship, will be essential to remove the discrimination inherent in the current system." Prior to such a law being approved, the report suggests other solutions, such as setting a deadline for legalizing unlicensed churches, removing security agencies from the approval process, and enforcing the law's provision which prohibits closing unlicensed churches with pending applications. The United States should push for long-term changes such as a unified law for all houses of worship, said Mahmoud Farouk, one of the authors of the report, in an email to the Washington Free Beacon. It should also press for "promoting tolerance through the media and educational system." "The United States should raise these issues privately with Egyptian officials and address them publicly, including through congressional hearings," wrote Farouk. This entry was posted in Issues and tagged Egypt, Religious Freedom. Bookmark the permalink.